In their first game since QB Carson Wentz went down with a torn ACL to end his season, the Philadelphia Eagles offense didn’t miss much of a step Sunday, putting up 34 points on the New York Giants. It was the defense that struggled, letting the Giants score enough points that the final margin was only a 34-29 relative squeaker. The Eagles trailed by 13 early in the second quarter, with the Giants in front 20-7, but quickly came back. New starting QB Nick Foles threw for 237 yards and 4 touchdowns in the game, connecting with Alshon Jeffery, Nelson Agholor, Zach Ertz, and Trey Burton. With that, we give you our PFF-exclusive takeaways from the contest for each team. The final statline looks like Foles picked up where Carson Wentz left off, but the journeyman backup making his first start since Week 9 of 2016 with Kansas City struggled throwing deep and outside the numbers right. Foles was able to connect on just one of his four deep targets while completing just two of six to the right of the hashes beyond 10 yards. When given a clean pocket, Foles picked apart the Giants secondary completing 67.9 percent of his passes for 6.7 yards per attempt and all four of his touchdowns. He put the ball in harm’s way on a couple of occasions but Foles managed the game well in place of Wentz. Give the big man up front some love, as Kelce dominated once again in the run game as he continually paved the way for Eagles’ running backs. Reaching 1- and 3-techs on outside zone, Kelce’s quickness was too much for the Giants interior defensive linemen. Kelce was better than usual in pass protection, getting beat just once on 40 pass-block snaps. 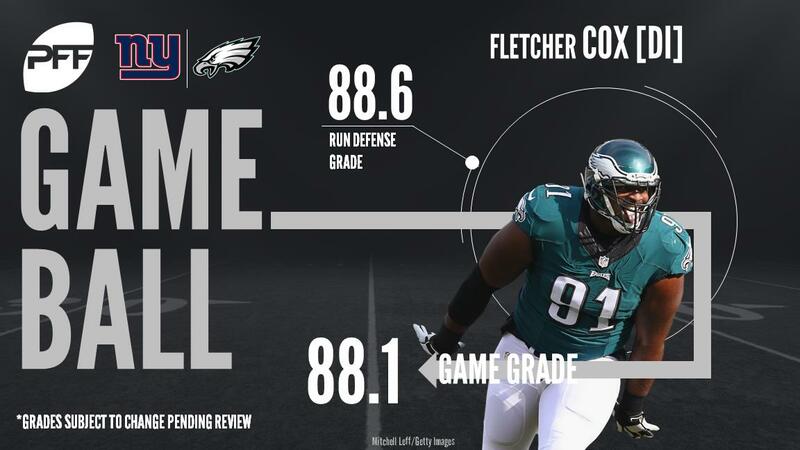 Cox played a huge role in the Giants’ run-game struggles in Week 15, finishing the game with a near-elite 88.6 grade in run defense. He only tallied one stop on the afternoon but he was a disruptive force all afternoon, routinely beating blocks to clog points of attack and make holes disappear. Cox also recorded four pressures (three hurries and a sack), making Week 15 the ninth time this season he’s had at least three pressures. Graham was on the field for 53 defensive snaps against the Giants this week. His season high entering Sunday was 41 snaps back in Week 2, and he hadn’t been on the field for more than 23 snaps since Week 7. The veteran took advantage of the extra playing time and turned it into a solid afternoon of coverage. Graham saw six targets into his coverage and allowed three of them to be caught for just 19 yards total, Eli Manning had just a 56.9 passer rating when targeting Graham in Week 15. Manning made a bunch of nice throws in this one as he and the Giants offense had success throughout the afternoon moving the ball up and down the field. The veteran quarterback struggled throwing deep though, completing just one of six attempts that traveled 20 or more yards in the air, and he nearly threw the Giants’ chance at a late-game comeback down the drain with a pass that Nigel Bradham should have probably returned for a game-sealing touchdown. Gallman didn’t get most of his touches until the second half, but he provided the Giants with some solid production on the ground on a day where Orleans Darkwa really struggled to get it going. Gallman forced two missed tackles on eight attempts and earned 24 of his 39 yards after contact. Gallman has forced 15 missed tackles now this season on 86 rushing attempts, two more than Darkwa has forced this season and on 59 fewer attempts. Vernon was a force rushing the passer as he recorded five total pressures including a sack and three QB hits. A solid 10.8 pass-rushing productivity could have been more as he beat LT Halapoulivaati Vaitai on four more occasions but the pass was out too quickly to generate the pressure. To top it all off, his sack was a strip sack and added on a stop in the run game. Targeted a team-high seven times, Cockrell had a solid day despite giving up a touchdown to Alshon Jeffrey on an excellent double move in the red zone. He allowed just three catches for 29 yards with one pass breakup, good for 4.1 yards per target allowed and 0.74 yards per cover snap. Cockrell added two stops, one in the run game and one in coverage while not missing any tackles.